Students in level Alef-Bet are complete beginners and they have yet to master the Alef-Bet letters. Their primary need therefore, is to be acquainted with the letters in which will, in turn, facilitate the acquisition of the spoken language. There is a special accompanying workbook for this stage, (the acquisition of reading skills), and up to 2 days out of the ten are dedicated to this. This program is a vital component in laying down the foundation on which all further language will be laid and is in such of all importance. At this stage basic sentence structure and parts of speech are encountered and the most basic of vocabulary is introduced. The three main materials that we use are Sefer Alef-Bet, Sefer Alef, and Sihon (students who show high learning skills might also start Sefer Hapoal which is the grammar book). All the materials are recorded and a full CD set is provided for each student. Students are strongly encouraged to listen and to re-listen to all the explanations and materials covered in the lesson time with the teacher. These audio materials also give the student the opportunity to hear the correct pronunciation of the vocabulary, in addition to them being able to hear the pace of speech. “Sefer Alef” is the main text book in this course and introduces the basic vocabulary and sentence structure used in the Hebrew language. It is a fundamental part in the course and majority of its content is covered during the directed learning sessions. The Sihon book (conversation manual) allows the student to acquire general conversational skills using dialogues that are taken from every day, real life situations. A precise methodology is used here in order to enable the student to make the change from his mother tongue to Hebrew. 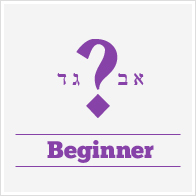 Sefer Hapoal (verb Book) introduces and familiarizes the student with the Hebrew verb system. It demonstrates systematically how different groups of verbs are generated using the Hebrew roots of the words and the basic structure of each verb “family”. During lessons dedicated to grammar, the level Alef-Bet student becomes familiar with the most basic rules that are necessary to help him to speak. Grammar is arguably the most complex component when learning a new language and it is easy for him to become confused and frustrated. In order to prevent this from occurring and to avoid ‘overload’ only once the teacher feels the student has grasped and feels comfortable with a certain notion, does he move the student forward to other material. All efforts are made for the student to draw maximum benefit from all that he or she covers and thus a constant balance is preserved during classes.